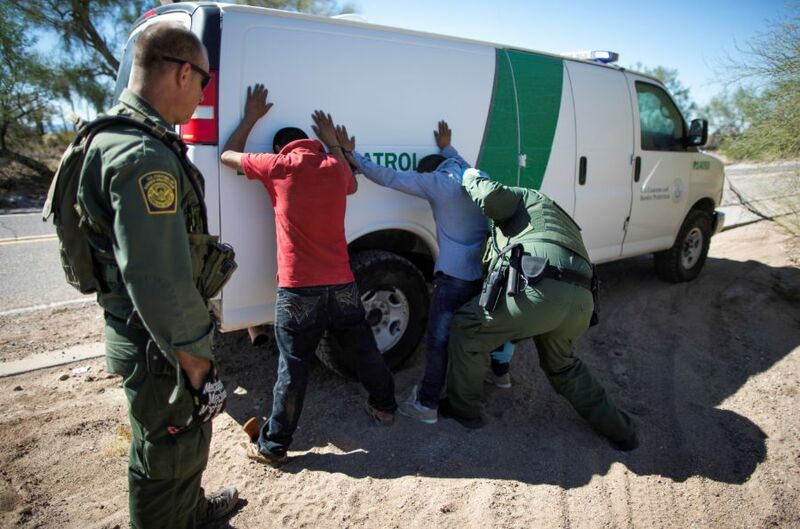 Border Patrol agents arrest migrants who crossed the U.S.-Mexico border in the desert near Ajo, Arizona, U.S., September 11, 2018. The U.S. border with Mexico is at a “breaking point,” Trump administration officials say, with arrests of illegal immigrants surging to record levels. In February, border agents arrested more than 66,400 people for entering the country illegally, the highest number recorded since 2008. Homeland Security Secretary Kirstjen Nielsen outlined the latest numbers in an appearance Wednesday before the House Homeland Security Committee, now controlled by Democrats. The Republican-controlled Senate Judiciary Committee also held a hearing Wednesday to examine border security. The latest numbers come as President Donald Trump makes his case for his declaration of a national emergency to secure funding to build and add to barriers along the southern border. Since 2014, the number of families arriving illegally has increased dramatically. This poses a difficult challenge for Border Patrol officials, who have been clear they don’t have the infrastructure to respond to the influx of families — specifically children. According to statistics released by U.S. Customs and Border Protection, 26,973 unaccompanied children have arrived at the border since Oct. 1, when fiscal year 2019 began. This is a 54 percent jump from the same period last year. The number of family units apprehended increased by 338 percent, with 136,150 families apprehended since Oct. 1, compared to 31,100 over the same period the previous year. The Democrat-controlled House last month voted to block Trump’s emergency declaration, with 13 Republicans joining them. The measure now moves to the Republican-controlled Senate, where the president faces an uphill battle. At least four Republican senators — Rand Paul of Kentucky, Lisa Murkowski of Alaska, Susan Collins of Maine and Thom Tillis of North Carolina — have vowed to vote with Democrats to block the president’s emergency declaration. The U.S. border with Mexico stretches for more than 2,000 miles. Securing it, experts say, is only a start to addressing the crisis. There is no doubt that illegal aliens are attracted by what they’ve seen and heard about the sanctuary policies being implemented by states and cities to obstruct immigration enforcement; the ability to abuse asylum policies; and the misinterpretation of federal law by the courts that allows families with children free rein to be caught and then released into the interior of the country, where they can disappear and face no consequences for their illegal actions.